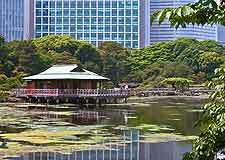 Tokyo is a modern, 21st-century city filled with skyscrapers and office blocks, and yet still successfully manages to retain many of its important parks and Japanese gardens. 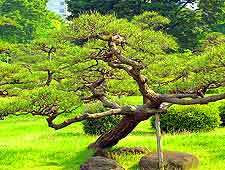 Visitors to Tokyo often enjoy a stroll around the beautiful Imperial Palace East Garden, while for traditional Japanese landscaping at its very best, the Jindai Botanical Park, Hama Rikyu Garden and Kiyosumi Garden are all equally impressive. Each of the city's parks serves a different function within the Tokyo community and many, such as the Hibiya Park, are popular recreational spaces, where you can enjoy an array of summer events, or simply find a bench or peaceful spot to enjoy your lunch. 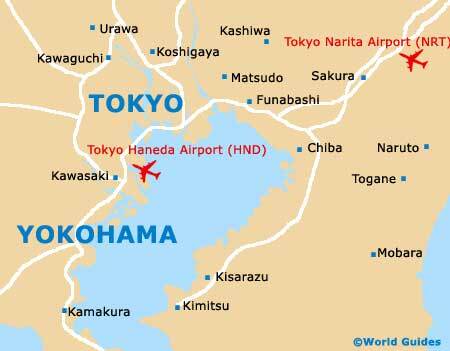 Tokyo's main parks are explained below. 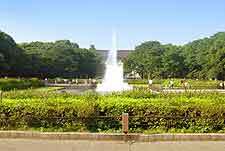 Ueno Park can be found at the top of Ueno Hill and was the city's very first public park, opened in the early 1880s. The park boasts a very popular city zoo, together with a number of top-class museums, shrines and temples, historical and cultural monuments, hundreds of cherry blossom trees, a spreading lake, and also a stunning lotus pond. Close to the bay and known for its meticulously clipped trees and tremendous attention to detail, the Hama Rikyu Garden lies within the Ginza area of the city. When strolling around these peaceful gardens, look out for the eye-catching teahouse, large pond and traditional bridges, all of which typify Japanese landscaping at its best. An important part of the Ginza district and popular with local businessmen at lunchtimes, the Hibiya Park is full of interest. With a steady flow of visitors seven days a week, the park is just a stone's through from Tokyo's famous Imperial Palace and regularly hosts many of the city's most notable outdoor events and concerts, which are often staged around the park's arena. Featuring many themed garden areas and a breathtaking array of literally thousands of plant specimens, Tokyo's Jindai Botanical Park is located next to the historic Jindai Temple. During the summer months, the park's extensive collection of roses is especially colourful and fragrant, while for others, the dramatic fall colours of the Japanese maples each autumn affords endless photo opportunities. 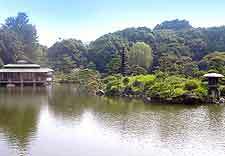 Best known for its rather unexpected collection of enormous rocks, which were carefully arranged more than 100 years ago, the Kiyosumi Garden offers plenty of secluded spots, where you can sit and enjoy the surrounding scenery and clipped trees. With large areas of water connected by bridges and winding pathways, the gardens will take several hours to fully explore. A scenic and tranquil spot away from the hectic pace of life in Tokyo city centre, Kyu-Shiba-Rikyu Gardens is filled with landscaped areas, mature planting and old trees, providing welcomed shade on the sunniest of days. Central to the gardens is a large pond, much of which is surrounded by big rocks and marginal planting. 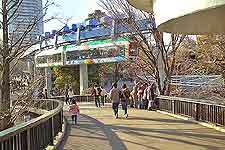 Particularly popular with families, Inokashira Park boasts many attractions that appeal to children. Highlights include a small petting zoo filled with friendly animals, a boating pond complete with paddleboats, and numerous open areas suitable for picnicking. For the adults, the seasonal cherry blossoms in the spring are not to be missed.